Vijay consoled the families who have suffered greatest loss of their beloved, and gave away a compensation of Rs one lakh to each kin of victims. 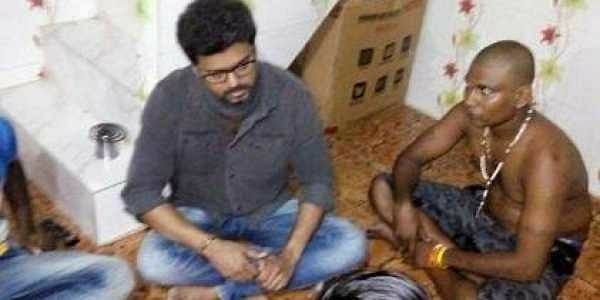 THOOTHUKUDI: Actor Ilayathalapathy Vijay made an inadvertent visit to the houses of 13 gunfire victims on Tuesday night and in the wee hours, and had distributed Rs one lakh compensation to each of the inconsolable families. The actor who have a sizable fan follower in Thoothukudi visited houses each of the 13 victims shot dead during the anti-Sterlite rally taken out on May 22. Vijay came in a car along with three other persons to Thoothukudi and made a visit to the bereaved families houses in a bike. While consoling the victims, the 43-year-old actor sat down the floor and talked to family members and exhorted them, according to sources. Vijay fans club district president Billa Jegan told Express that the well famed Kollywood actor came to the town only to console the victims of late. He came in a car and went around the streets in bike to visit victim's houses. He did not even inform us, and requested not to publicize his visit, he said. Vijay consoled the families who have suffered greatest loss of their beloved, and gave away a compensation of Rs one lakh to each kin of victims, he said further. One Maharaja, brother of gunfire victim Karthick of Sivanthakulam middle street, told Express that the actor came to his house at around 11 am. His family members did not expect his visit and he was shocked to see the actor at his house. "The actor humbly asked if he can come inside the house and requested sorry for disturbing them at night hours. He sat on the floor and asked about the incidents for five minutes before leaving the house", said Maharaja. After visiting all the victim houses, the fan clubs district president escorted the actor till Tiruvandrum airport by 6.30 am, from where he flew back to Chennai, said Jegan. The actor's midnight visit enthralled Thoothukudi residents.